A drug-driver who crashed his car on the A46 after a high speed chase out of Leamington has avoided jail. 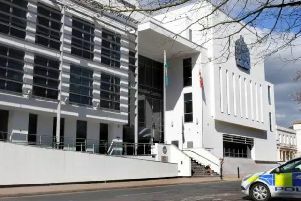 Aadil Choudhury, 26, of St George’s Road, Coventry, reversed away from a police officer who stopped him in Leamington and drove onto the pavement to get past a ‘road closed’ barrier, triggering a high-speed chase. But after reaching 100mph along the A46, he lost control when he swerved onto a slip-road – and veered across all three lanes before ploughing into the central barrier. He did not hit any other cars, and luck was on his side again when, because of delays in his case getting dealt with, he escaped being jailed. Appearing at Warwick Crown Court almost a year after pleading guilty to dangerous driving, Choudhury was sentenced to ten months in prison suspended for two years. He was also ordered to do 100 hours of unpaid work, to pay £120 costs, and was banned from driving for three years. Prosecutor David Bright said at 7.15pm on Sunday February 21 last year the police had reports of a car acting suspiciously in Beauchamp Road, Leamington. As the officer was talking to him, he suddenly reversed away from her before driving onto the pavement to get past ‘road closed’ signs as he headed towards Kenilworth Road and the A452. Driving with his lights off, he overtook other cars, driving on the wrong side of the road at speeds of up to 70mph along the 40mph limit A452. He then turned onto the A46 Kenilworth bypass where, having turning his lights on, he switched across all three lanes as he weaved between other traffic at around 100mph. But when he then swerved onto the slip-road at the Stoneleigh junction, Choudhury lost control of the Fiesta which veered to the right, across the grass verge back onto the A46 and across all three lanes before crashing into the central barrier. When he was interviewed after being arrested, Choudhury said he had panicked because he had been smoking cannabis. The court heard Choudhury had pleaded guilty as long ago as May last year, but his sentence was delayed until an earlier drugs case in which Choudhury was involved had been dealt with. His barrister Simon Hunka said that although it was dark and Choudhury did not have his lights on, there was not a lot of other traffic at that time on a Sunday night. Sentencing Choudhury, Recorder Christopher Donnellan QC told him: “It is fortunate that neither you nor anyone else was killed. “Although not charged as an offence involving drugs, you were under the influence of cannabis at the time. There is no doubt in my mind that this crosses the custody threshold.